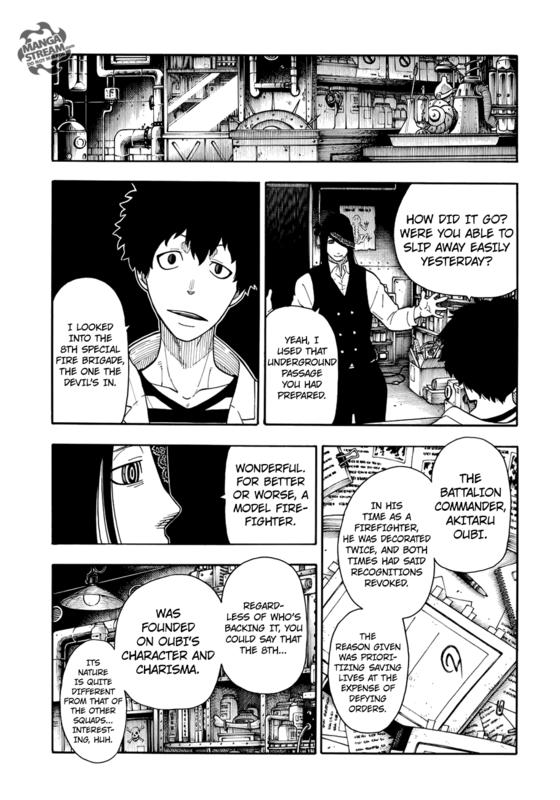 Akitaru tells Shinra the origins of the fire brigades. 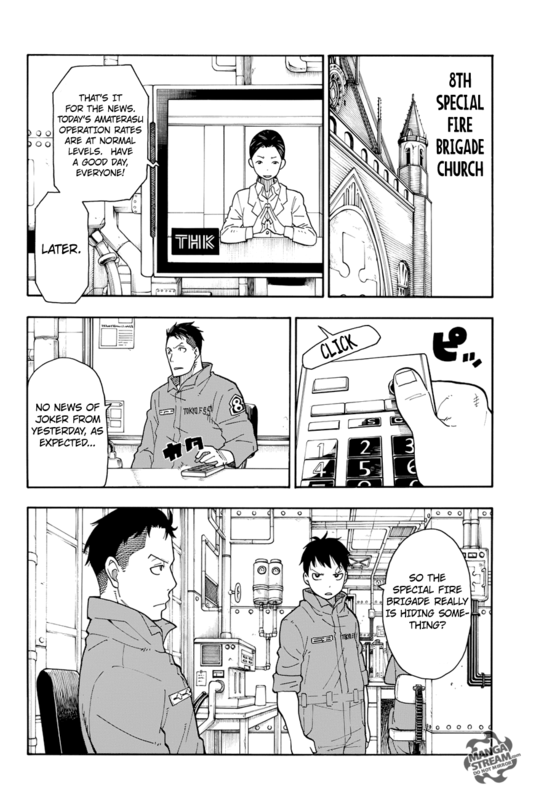 The Brigades were formed from three organizations the Fire Defense Agency, Tokyo Military, and the Holy Sol Temple. He reveals that each organization has its own “power dynamic”. 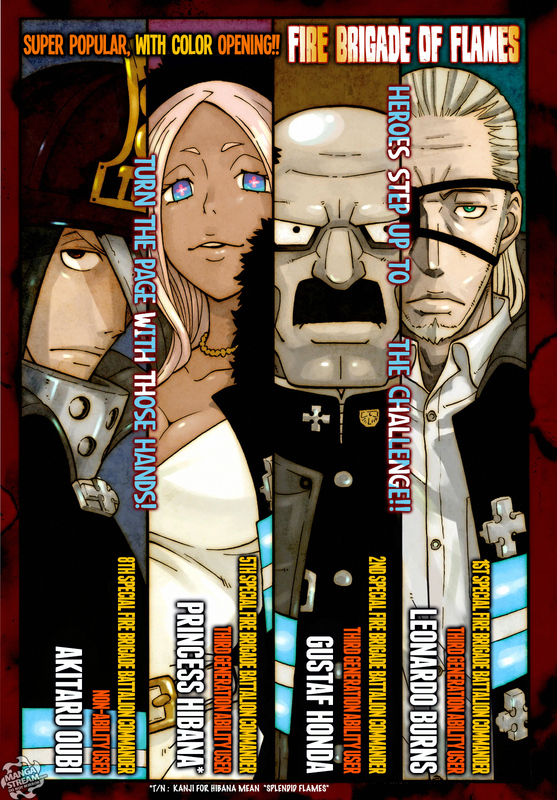 The 1st squad, the power of the holy sol temple is centered around members of the temple. The 2nd squad reports directly to the military. 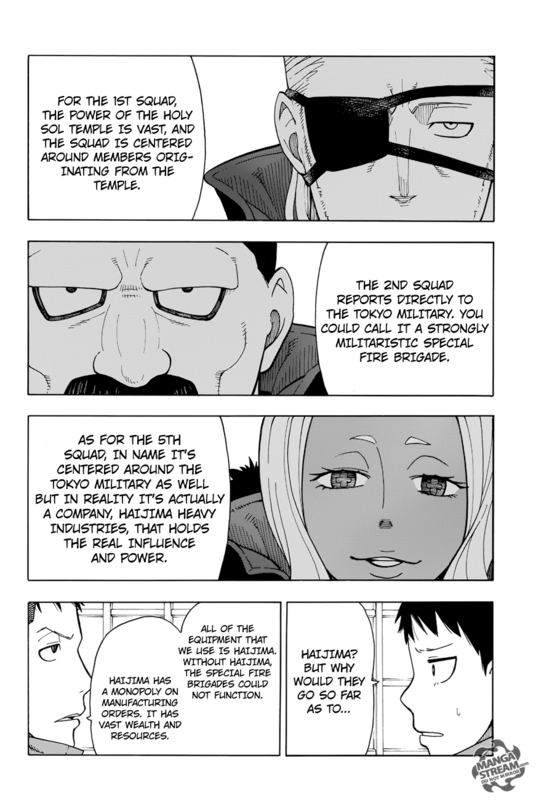 The 5th squad is a company, Haijima Heavy Industries. Haijima provides the Fire Brigades with all the weapons. The company has a monopoly on the manufacturing of these weapons and vast wealth, with substantial resources. Each and every squad is still responsible for the “souls of the Flame people“. The squads don’t share information with each other. Akitaru concludes that the organizations generally are “just.” However, he maintains that he has suspicious of them as well. Shinra asks the purpose of the 8th squad. Akitaru says that the 8th squad was “forcibly created with members from the fire defense agency”, they’re purpose is to investigate squads 1 through 7. Shinra begs to “work on the investigation”, Akitaru says he’s glad that Shinra was assigned to the 8th squad. Takehisa Hinawa reveals the results of the powder that Joker used. He concludes that the powder is “ash” from the flame people. Meanwhile, Joker discusses the events of the tournament. His associated say’s that the 8th squad is different from the other ones. The 8th squad receives a call of a “dog in the tree.” They discovered that the “dog” was Mamoru from 119. He flies down and tells Shinra that he “was passing out balloons at a local event” and, “some college students took him for a ride“. He discusses the serial killer who was a firefighter. 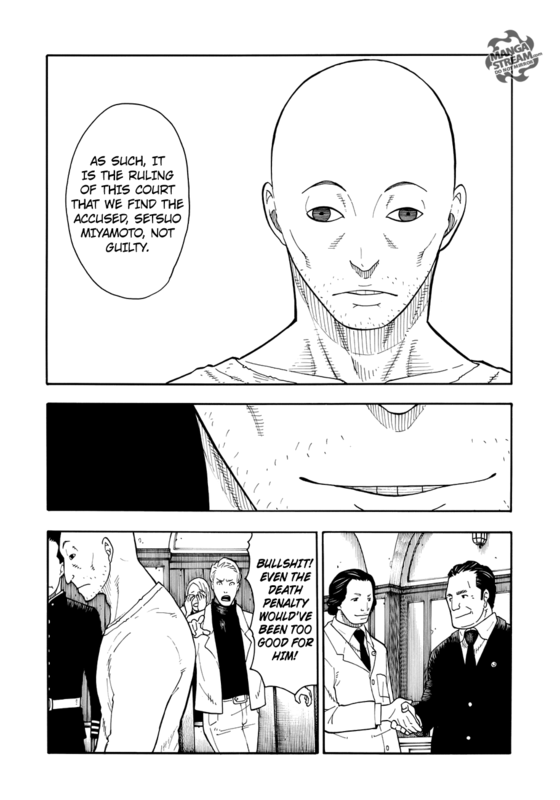 The firefighter, Setsuo Miyamoto is released due to his insanity. The family of the victims are understandably angered. Miyamoto thinks to himself that the “laws are such a farce”, and the “very foundation of this country would be in trouble if a firefighter like me were found guilty”. He instantly bursts into flames and screams for help. The families mocked him and he kills them with the flames. The 8th brigade is informed of the new flame person, who appears to have maintained his mind. 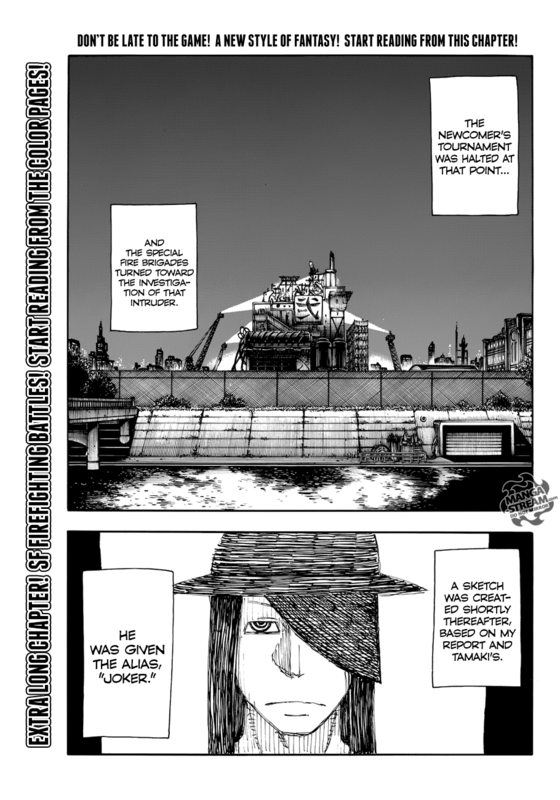 This chapter has added a great deal of information to the story of the series. I’m curious about the other brigades that weren’t mentioned. 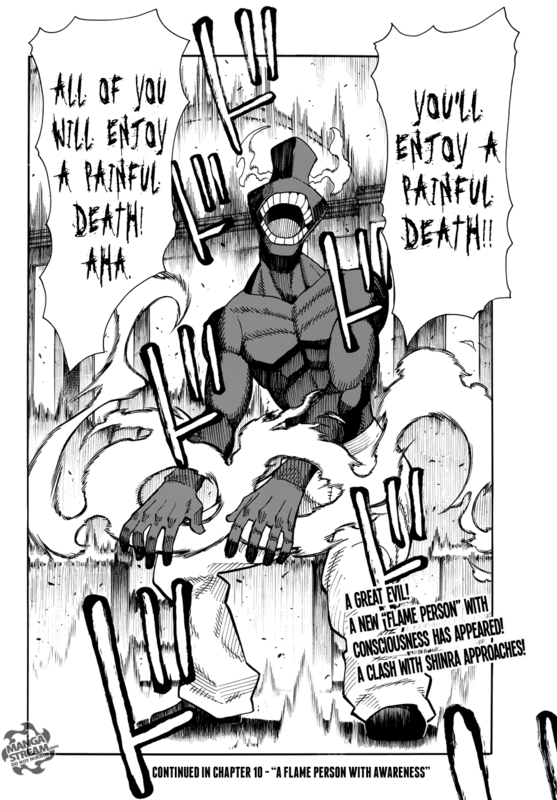 This chapter managed to answer several question while bringing up some new ones. I’m excited to read the next chapter. The members of Fairy Tail are shocked with the actions of Natsu. Laxus thinks he was being “hot-headed”, and Gray considers changing their plans. Ezra stops them, telling them to let “Natsu handle Zeref.” Gray questions her sanity, but she has confidence in Natsu ability. Gray say’s that she “puts too much trust in him.” She wonders why Gray “thinks so little of Natsu” after all they been through. Lucy stops them, and they decided to rely on Natsu. Meanwhile, Natsu and Happy arrive in front of the army. 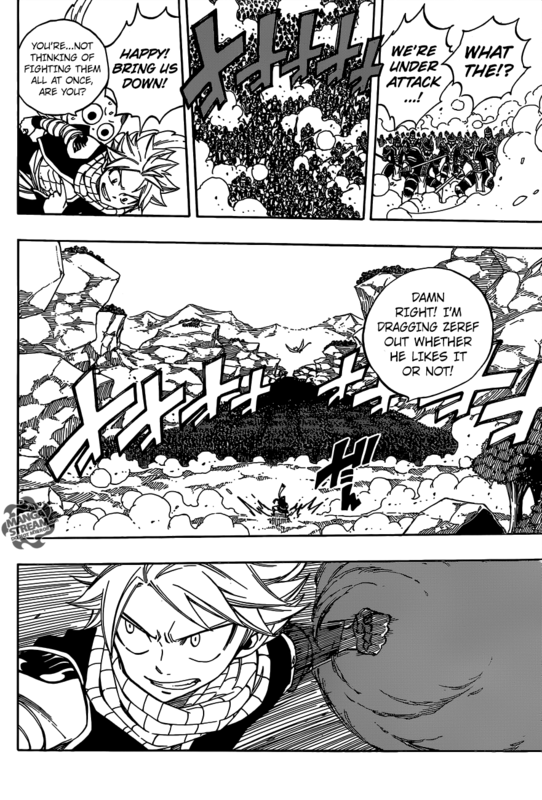 Natsu attacks the army head on. 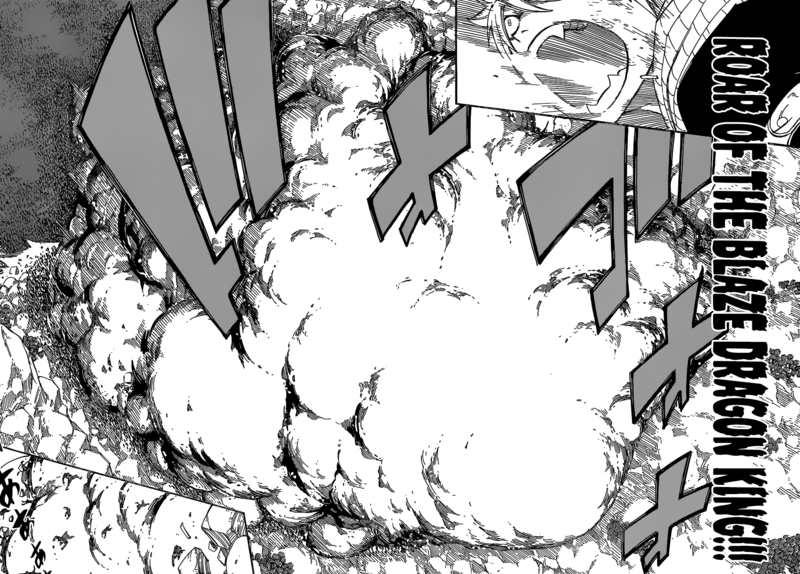 Natsu easily dominates the soldiers, and uses his “Roar of the Blaze Dragon King.” He defeats 973 soldiers according to Zeref, but 999,027 remained. Zeref and Natsu are prepared to face off. 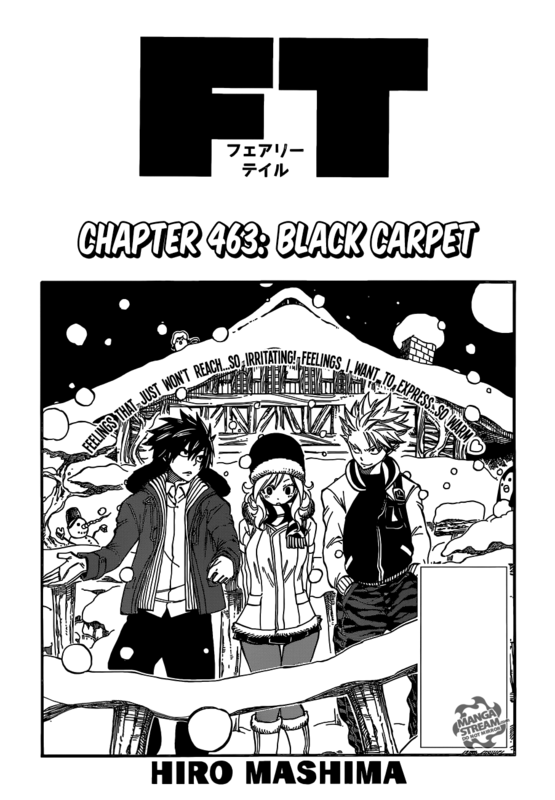 This chapter didn’t add much, but the quickness of the Natsu and Zeref encounter was surprising. I imagine that Natsu and Zeref fight will be saved till the last moment. It’s more likely that we’ll go through all the other fights before we conclude with Natsu versus Zeref.